Flaxseed oil has benefits for the body, skin, hair and nails. The Linum Usitastissimum, blue flowering plant, grows on the parries of Canada. This plant bears fruit containing several brown, glossy, seeds. 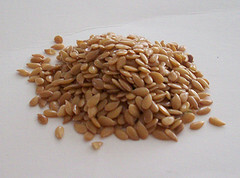 Flax oil is a clear yellowish liquid pressed from these seeds. It has a sweet, nutty, flavor and consistency like butter. Linseed oil is a name used interchangeably. Flax oil is used internally or externally. Find it in many liquid versions including capsules or pills. Before adding any supplements to your diet make sure they won't interact with any of your existing medications. Talk to your health care provider. Receive the best advice for your specific needs. Flax oil has a high quality protein, essential for healthy metabolism and absorption of nutrients. Other nutrients include: alpha-linoleic acid, lignans, vitamins B and E, fiber, lecithin, potassium, magnesium and zinc. Flaxseed oil is rich with Omega 3 and Omega 6 essential fatty acids, (EFAs). The body cannot make these on its own. They must be found from external sources, like diet or supplements. If you're body is deficient in them, it can cause havoc. Approx. 2.5 g of Omega 3 essential fatty acids are in one teaspoon of flaxseed oil. This Omega 3 amount is 50% higher compared to fish oil! CAUTION! Incorporate the right balance of Omega 3 and Omega 6 EFA's, for a healthy lifestyle. Excessive amounts of Omega 6 fatty acids compared to Omega 3 can leave you more vulnerable to diseases. The University of Maryland Medical Center suggests maintaining a ratio of 2 to 1 and up to 4 to 1 of Omega 6 to Omega 3 fatty acids. Your health care provider can determine if your Omega fatty acid diet is healthy. Eat healthy food choices. Omega 6 fatty acids are obtained by eating meats and vegetable oils. Omega 3 fatty acids are obtained by eating salmon, walnuts, flax seeds, olive oil, whole grains, fresh fruits and vegetables. CAUTION! Avoid flax oil if you're: pregnant, breast feeding, under age twelve, have intestinal blockage, nausea, diarrhea, gas or stomach pain. Avoid if you're taking anti-platelets or anti-coagulants. Do not take ANY drug, for at least 2 hours, once flaxseed or flaxseed oil has been taken. If in doubt, consult your health care provider. Flax oil is an anti-inflammatory. The alpha-linoleic acid and other related chemicals reduce swelling of joint pain, morning stiffness or Rheumatoid arthritis. It hydrates skin, locking in natural moisture. The alpha linoleic acid helps reduce fine lines, making skin appear more youthful. Flax oil reduces redness associated with acne, rashes, minor burns and rosacea. It softens skin, reduces scars and helps heal abrasions. EFAs provide cellular activity and skin regeneration. The Omega EFAs nourish hair follicles and improve scalp conditions. They encourages strong and shiny new hair growth. Blood flow to the scalp is improved. Hair follicles absorb proper nutrients. The immune system is strengthened fighting against inflammation, skin and scalp infections. Relive dry hair, scalp eczema, scalp psoriasis and hair loss! The Omega EFAs in flax oil nourishes dry, brittle, nails. They prevent nails from cracking and splitting. Blend together: 1 tbsp. flaxseed oil, 2 tbsp. raw almond butter, 1 small banana, 1/2 cup organic apple juice and 1 cup ice cubes. This recipe is healthy for the body and soothes red, irritated, puffy skin. -- HOMEMADE SKIN CARE RECIPE: Dip wet warm washcloth in plain flaxseed oil. Apply directly on face or skin. Let set for two minutes. Use mild cleanser. Rinse, thoroughly, with warm water. Gently pat dry. -- HOMEMADE FACE MASK: Mash one avocado flesh. Add 1 tsp. flaxseed oil and 1 tsp. honey. Mix well. Apply mixture to clean face. Avoid eyes, ears, nose, mouth or any other sensitive areas. Leave on 15 minutes. Rinse face with warm water, thoroughly. Gently pat dry. If desired, apply a gentle, natural, moisturizer. -- HAIR CARE RECIPE: Wet hair. Massage a small amount of flaxseed oil on scalp and through hair. Gently comb hair. Wrap hair in warm towel for 15 minutes. Wash hair with gentle, natural, shampoo. Rinse hair with water, thoroughly. Let hair air dry or gently towel dry. Do not use hot air blow driers. They can weaken hair. If desired, use low or cool air settings. Condition, strengthen, add thickness, softness & shine. Store flaxseed oil in a non-transparent bottle in cool, dry, dark location. Light is more damaging to this oil than heat, especially bluish fluorescent light. Its unopened shelf life can be a few weeks up to six months. After opening, refrigeration is necessary to avoid rancidity! Discard any oil with an unpleasant, foul or rancid odor. Once a bottle or capsules are opened they should be used up within 2 to 10 weeks. Flax oil can be used for making homemade soap, lotions, creams and balms! Use it alone or mixed with other oils. Combine with Calendula Oil and Mango Butter to relieve dry skin. Susan of North Syracuse, NY shares a soap recipe! She combines coconut, flax seed, olive and palm oils for an ultra creamy bath bar! SOAP MAKING TIPS! Caution! Watch out for orange spots in your homemade soap! They can form and develop within weeks. Flax oil is fragile! It can go rancid, very quickly! Use it with formulations that are well preserved with antioxidants. Refrigeration and the addition of antioxidants will extend the life of this oil. Find the specialty or soap making oil right for you!